between my home and my office. Guess which one I checked into first? If you picked the one on the left, you are right! Why? Because to Google an address, all I need to know is the address, something I obtained while driving by on the very first day the house went on the market (I don’t think I even slowed down). “QR-ing” an address, on the other hand, requires pulling into the driveway (it’s a busy street), parking the car, walking up to the sign, opening up the QR app on my smart phone and taking a picture. Cool, but not convenient. Here’s the thing. I love technology. Chances are, I’m using apps on my phone and services to run my business that many people have never even heard of. But those are for my own purposes. going to be able to figure out and use easily. As a practical matter, that almost always means standing several steps back from the leading edge of what’s possible. Cool is indeed cool. But convenient and obvious is where the sales come from. Convenience will ALWAYS win me over. Hands down. I should probably note that I just bought a house and I was Googling addresses without the nudge. I was also using Google Map’s satellite view to eyeball the backyard AND Google Map’s street view to check out the neighborhood around the houses which fit my search criteria. All makes sense, Lauren. In fact it’s amazing to me how much a roll of the dice our first home purchase was waaaaay back in 1990! Didn’t know much back then except what the realtor told us. In many cases, Bing’s “Birds Eye” views are even better. Four shots, N/S/E/W taken from aircraft… but of course the real estate agent wants you to get to his or her site, not just check out the property from afar. Personally I don’t care how people find my listings – I just want them to find them! And the more information they have BEFORE they contact me, the better. That way, they qualify themselves because only the seriously interested will contact me (or their own realtor) for a showing. I agree – many realtors treat information like it’s a big secret that only they can share. I feel exactly the opposite. I don’t own the listing or the information about it – my client does. it’s my job to share that info. creatively with the best selection of buyers possible. Same with my buyers – I give them all the info I can (and I talk them out of making purchases sometimes), so that when they do buy a house, they will be absolutely delighted with the help I gave them. I want my clients to throw my business cards at anyone who mentions buying or selling real estate! I love that approach Laura! Spot on, as usual [King Friday]. I don’t even own a smart phone so I’m sure as heck not going to “QR this!”. I’d go one further and say that the Google This Address should read “Google 123 Sesame St”, particularly in locales where the house number may not be easily visible from the road. Sure, but (IMHO) if you stand to make several percent on the sale of the house you can probably afford the extra $ to customize the insert. Both listings are with Remax. If I worked at Remax I would be concerned that going to Remax.com is not the first option that comes to peoples mind. Great thought and I agree. Another possibility for that sign is to do both. There is room at the top for the “Google This” and at the bottom for “QR This.” It is like communicating – give people different ways to reach us. This is the same reason that restaurants have menus. We all communicate differently. Some realtors assign a keyword/shortcode for texting. Simply text 33333 to 77777, for example, and you’ll get basic info (address, price) and a link to the full listing for more info. That’s a great idea! Easier and more immediate than the other two. Many options indeed. Now if only these houses would sell! What great advice. As a realtor, I struggle with how to get the maximum exposure for my listings, but I never thought of just googling the address. I just tried it and it took me to the virtual tour posted on YouTube! Amazing. I agree that it’s much simpler than QR. If someone has a smartphone they can google right there, if not, just note the address down and do it at home. Thanks Laura! And don’t worry about the husband, your secret is safe with me (shhhhh). Laura, check out my reply to Michael above. Google was my favorite tool while house shopping! I agree in this context. A time and a place for everything though. We use QR codes very successfully with our printed marketing collateral, business cards and at trade shows. As a technology company is exciting to use this new technology. Not driving down the street. Although I do have to admit, last weekend on our walk throuhg the neighborhood to a Memorial Day party, a house for sale had a QR code on the sign. As a geek, I did scan it because I was interested in the price and the details. But again, I was on the sidewalk, already walking down the street. I had driven past the sign 1/2 dozen times prior to that and never did I think of parking and getting out to scan it. Great point, David. Context is key. For example, I’ve seen them on the subway – a place where you’re often just standing there, iphone in hand, killing time anyway. In that context, it’s actually a welcome relief and I’ve followed many QR trails! Nothing beats a faster route to “online” eyeballs than a good 2-3 minute video tour/infomercial of your listing uploaded to Youtube. A smart headline, description and tags will have your personal video tour in the #1 spot on the very first page of Google using very relevant search terms within minutes of posting usually. * A buyer ready to purchase a 4 bedroom home in Solana Beach CA is way beyond “Solana Beach Homes For Sale” in their search queries. Instead try, “Solana Beach 4 bedroom ocean views walk to Santa Fe Christian” and you’re much more likely to find the buyer for your listing for FREE from Youtube. The video tour I made in the example was done from my smart phone while waiting for a buyer and agent to arrive for a private showing. Great info, Chris, thanks. And I love the way it’s done right from your phone…. One can always Google an address if you know the address. 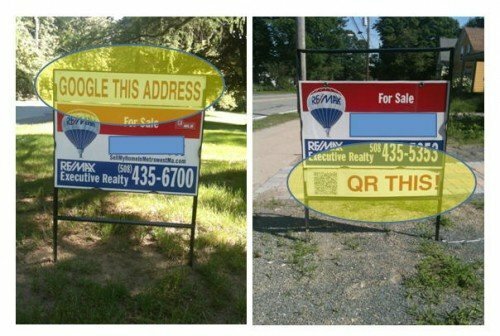 So the better marketing plan is the second one, because (a) it’s already obviously google-able, and (b) the QR leads to a website about that house, which Googling does not. Thanks Wyn! And a good point. While the QR code may connect one savvy individual at a time to a property specific website, I like Michael’s reasoning. It’s not difficult to have a property specific website pop up via common (smart) Google search terms and it will appear for everybody using those common terms, not just one person scanning a QR code. QR codes are cool and you can throw one on your sign to let the hipsters know you’re up to snuff on technology but I think I could put the extra space on yard signage to better use a 24-Hour Toll Free Recorded Info line.